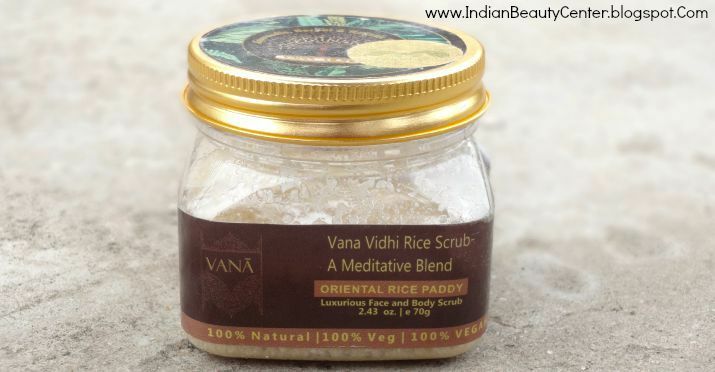 Product Description : This luxurious Brown Rice Oriental Scrub from VANA is a unique composition of ingredients that we term as Ambrosia for the skin. Luxe Oils work toward a smoother, fairer and more radiant complexion over a refined skin texture while the Brown Rice is nature's gift for gentle yet deep exfoliation. 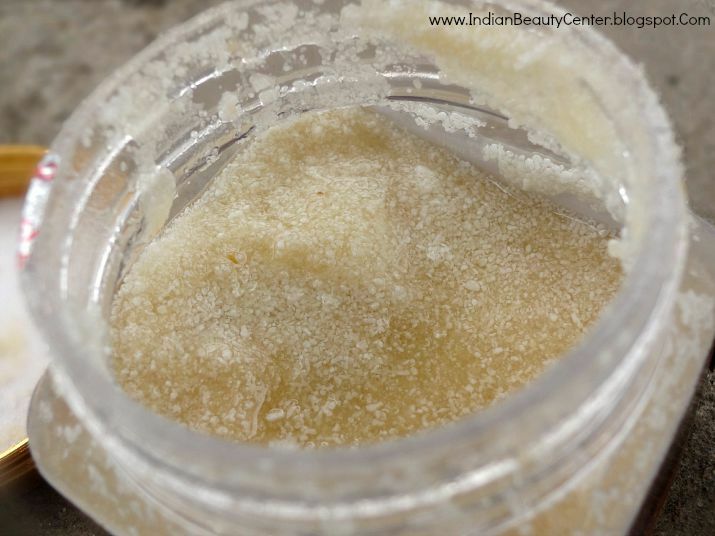 This natural scrub combats aging, wrinkles, pigmentation, tan very well, while adding an exuberant shine and illumination to lack luster skin. 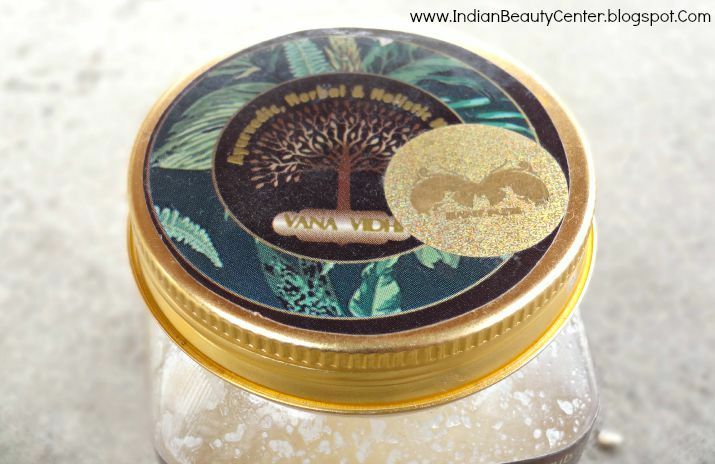 Be Beautiful with VANA's pristine luxuries. 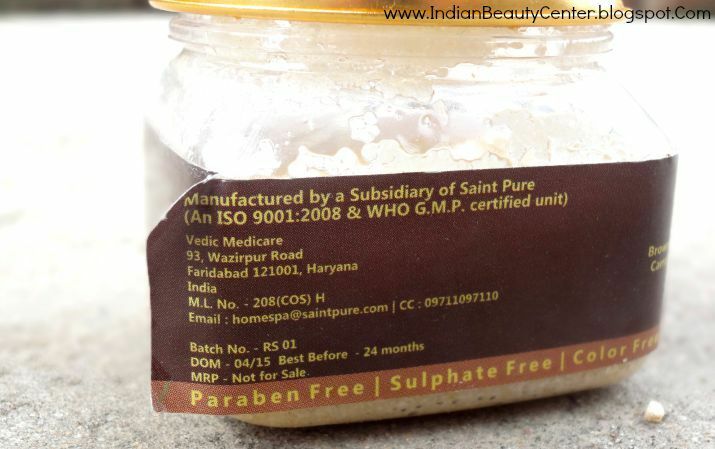 VANA Vidhi by Saint Pure offers none less than pure Ayurvedic, Herbal & Holistic Healing and Beautification Luxuries. The first thing that came to my notice is that it is 100% natural, 100% vegan, sulphate free, paraben free, color free and synthetic fragrance free. Now, these are actually the things I did not expect from a scrub. But then, I discovered this and it is my new love. 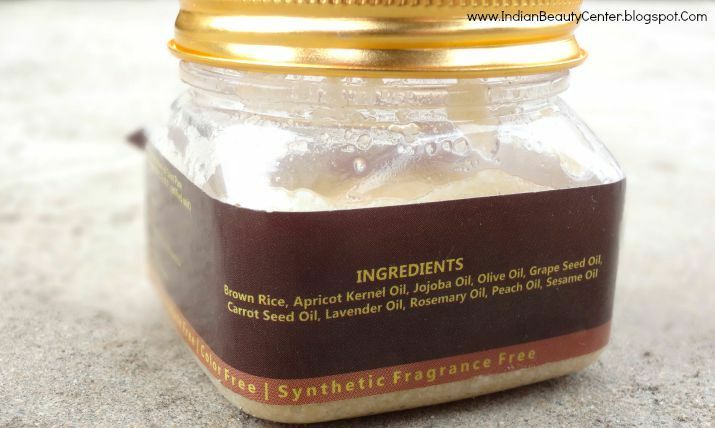 It comes in a tub packaging holding the coarse rice granules immersed in essential oil blend. The cap does fit tightly but still there are chances of product leaking out. So, it is not travel-friendly. You can transfer it to some other clean and dry, sturdy container and carry it with you. The scrub is just plain whitish in color, the rice granules being white and the rest of the mixture being slightly yellowish. It has a very heavy fragrance of lavender essential oil, which is a bit too strong but you get used to it after a certain period of time. It has coarse granules, making it apt for the body as well as the face. The oils settle down soon. So, I stir the mixture with clean, dry hands or using a wooden spatula before every use. Learning to use it properly was a bit difficult for me. But, now I can tell you the exact way to use it. First, take a clean plate and put around 1 spoon of scrub on it. Then, take some clean water and add it to the scrub and mix it well so as to make a watery paste. Then, its ready for use. It leads to a lot of wastage if you directly drub the scrub on your skin and the rice granules feel hard and harsh. Adding water softens the granules making it an amazing exfoliator for the delicate facial skin. You have to use medium pressure while applying it, otherwise you can damage your skin. I have very oily and acne prone skin. But even then, this scrub did not cause oil build up and never broke me out. It's such an amazing scrub, one of the best I have ever used. I have totally fallen for it. Just that, it's pricey. My skin glows, my face feels softer to touch and dead skin cells along with dirt and other pollution particles are removed nicely. I always use a clay mask after using this, as a part of my skin care routine, just to make sure the excess oil gets removed from my skin as it leaves a nourishing oily layer on skin. Dry skin will love it even more because it does not dry out the skin at all, rather moisturizes and nourishes it. It works nicely for the body too and removes a good amount of dead skin cells making my body glowing, moisturized and happy! All in all, this exfoliator is a pricey face and body scrub full of oils like sesame oil, lavender oil, jojoba oil and olive oil. Also, the use of brown rice makes it even more nourishing. I highly recommend all of you to splurge on this scrub and feel the difference in your skin! Final verdict- If you really want to try out a good scrub then go for this. It does its job nicely and does not break me out easily. Some people complained about fungus growing in the pot but this has not happened with my tub as yet. It makes the skin soft and is indeed nourishing. I highly recommend you to try this out. This is for all skin types. I don't mind the oily layer perhaps for my dry skin it wouldn't matter at all. But your detailed review made me wana try it out.